Water Heaters Only, Inc. offers complete water heater repair, replacement, and installation service. We specialize in residential, commercial and tankless water heater repair and replacement services throughout the entire San Diego area. We are licensed, insured and have been specializing in all aspects of water heaters since 1968. Water Heaters Only, Inc is considered an expert in the industry. We offer the highest quality work for the lowest price. In fact, that is our guarantee. Our years of experience, along with the use of quality products and pride in our workmanship, has kept our valued customers returning time and again while also referring us to their friends and family for all of their hot water needs. At Water Heaters Only, Inc., we know our customers need hot water quick so we answer our phones 24 hours a day 7 days a week. We do not charge extra for evening, weekend or holiday service. Water Heaters Only, Inc cares a great deal about our customers. Just read our online reviews, testimonials and customer feedback and you will see why Water Heaters Only, Inc has over 500,000 happy satisfied customers. We understand customer feedback is valuable and important for us to continue to grow and improve. If you are looking for a water heater company that can give you a competitive price and also save you time by arriving ready to get your hot water working again, call us 24 hours a day, 7 days a week, 365 days a year to schedule an appointment. It won't take you long to realize that we are the best and we are extremely proud of it! Thanks for the great service. Chris was at our house within two hours of my call. His work was so quick and efficient that he had completed installation within 90 minutes of arrival. I would highly recommend your company to my friends. 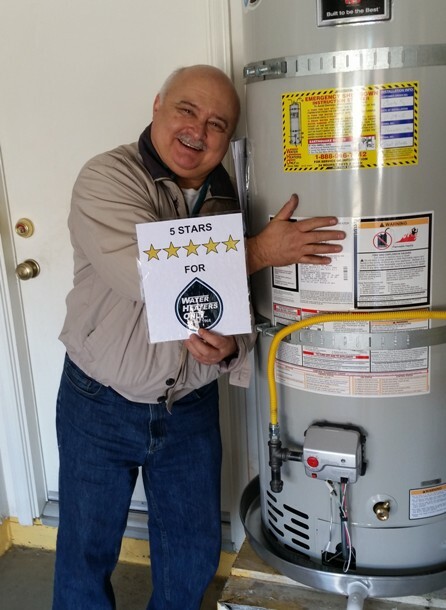 Pat installed my new water heater on 9/29/18 and did a great job. He explained everything up front and it was easy for me to understand what needed to be done. My 18 year old water heater was installed (by someone else) not quite to code, but Pat made sure the new installation fixed the old problems. I have used this company for my own homes and for my rentals for 10+ years and have never had a bad experience. Also, I have had quotes from the competition for as much as $1200 more for the same warranty, etc.